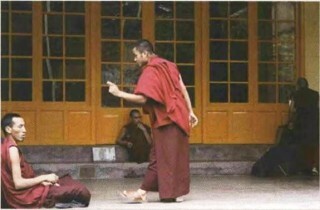 Monks in Mcleod Ganj sharing the “free-flowing and love-infused Dharma energy” in debating situations. Sometime in the mid-nineteenth century, the poet Matthew Arnold gave poignant and lyrical vent to his forebodings in his poem, “Dover Beach.” He spoke of the world as providing no certitude, hope, relief, or help from pain. We beings are witnesses on a “darkling plain, swept with confused alarms of struggle and fight, where ignorant armies clash by night.” How close to home that feels nowadays, how sickeningly true, causing pent-up tears to oppress the brain.